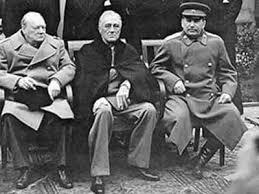 At this 1945 conference, Roosevelt, Churchill, and Stalin met to discuss plans to govern postwar Germany and to rebuild the war-torn nations of Europe. 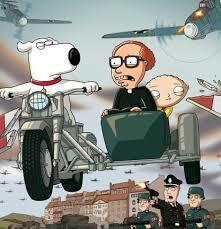 Select ALL countries that were in the AXIS Powers. 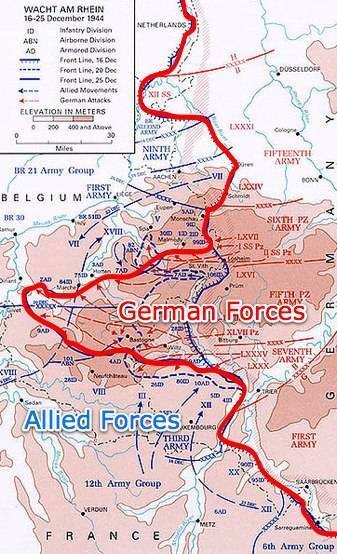 The purpose of this attack on Nazi-occupied France was to split the German army in half by opening up a western front in Europe. What phrase is used to describe the extermination of 6 million Jews by Nazi Germany? 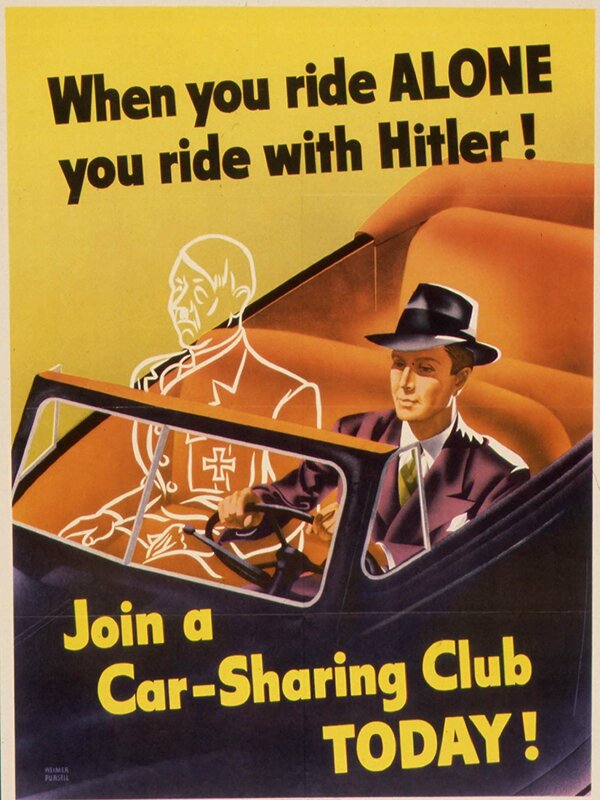 This is the tactic Germany used to take control of Europe quickly early in WWII. 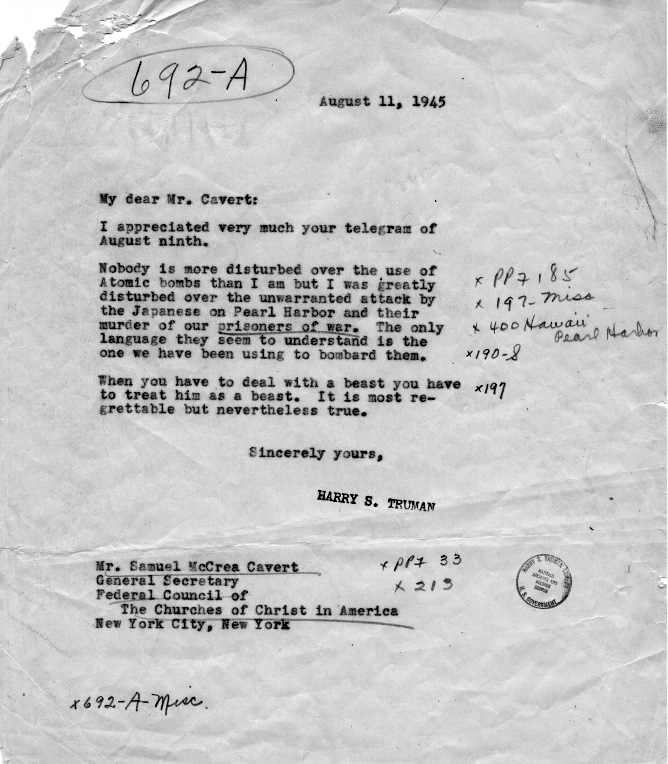 In 1939, the USA altered the Neutrality Acts to allow arm sales to Britain, but we did not provide loans nor did the USA offer to ship weapons to Britain on American ships. What was this program called? 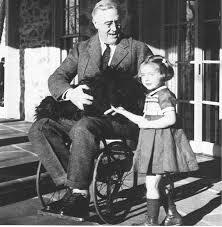 By allowing the United States to sell weapons using credit, loan weapons and supplies to the Allies, and transport the goods across the Atlantic Ocean, FDR called the United States "_____________________________"
This longest serving U.S. President died of a stroke shortly before the end of WWII. This law allowed the United States to sell and loan weapons and goods to Great Britain and the USSR and to transport the goods for them across the Atlantic Ocean for them. This man was the military dictator of Japan in WWII. A had achieved educational equality. B were not allowed into academic institutions. 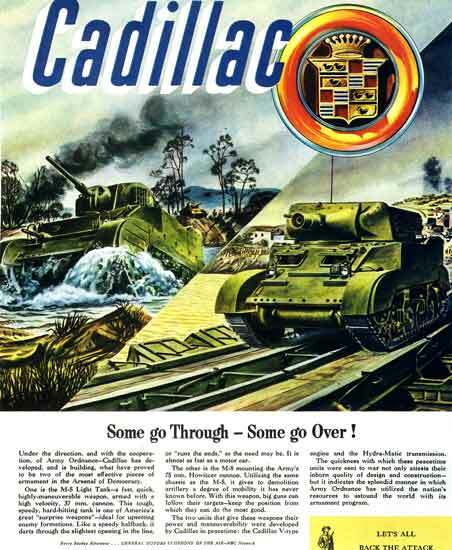 C were needed for the war effort in World War II. D were treated as second-class citizens in America. B increasing tariffs on imported goods. C borrowing money from the Allied Powers. D increasing tax rates and selling war bonds. 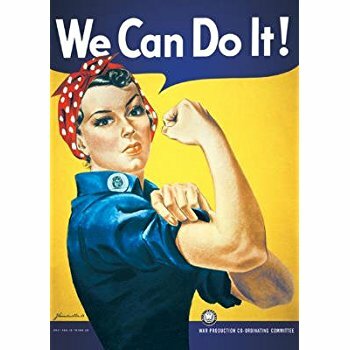 What role did "Rosie the Riveter" (seen here) play during World War II? A rationing consumer goods such as food and fuel. B decreasing taxes to encourage civilian consumption. C people giving up their homes to house soldiers stationed in that area. 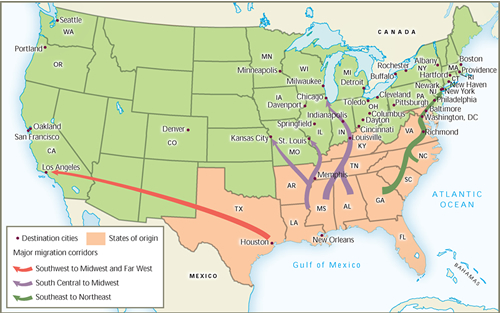 D relocating persons of Italian-American descent living on the east coast. 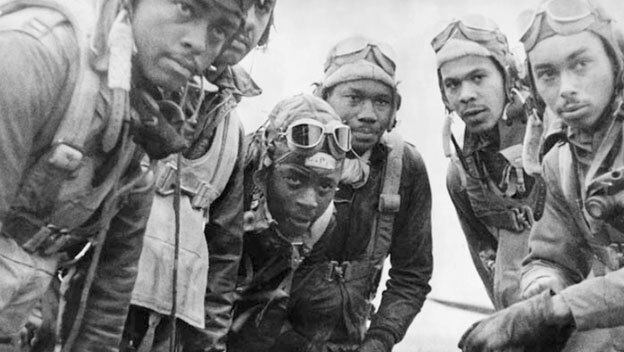 Which statement BEST describes the Tuskegee Airmen (pictured here)? B the first integrated combat unit in the U.S. Army. C the first African-American mechanics in the Armed Services. D the first African-American pilots in the U.S. Armed Forces. 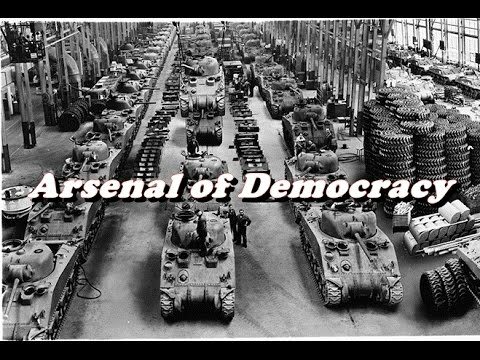 This government organization directed factories in the United States to make certain weapons and material needed to win WWII. This WWII era civil rights leader during World War II fought for equal pay for black workers and an end to segregation in the military. 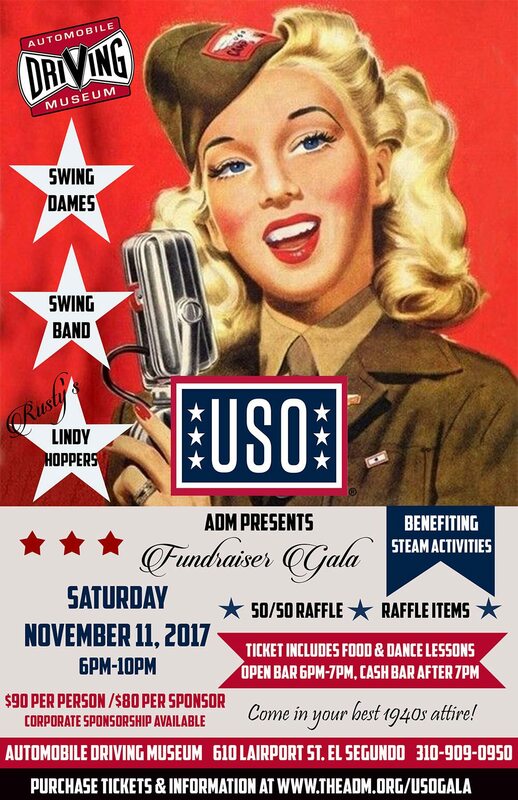 This organization was created to entertain US troops overseas. 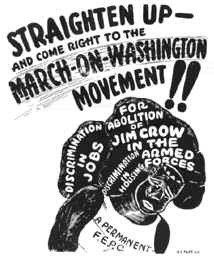 During WWII, African Americans continued the _________________________, leaving the Jim Crow South in search of war-related jobs in the North and West Coast. What was used by ordinary civilians to make sure there was enough goods, food and materials to ensure that the troops could win the war? How did World War II begin in Europe? Circle where Japan attacted on December 7, 1941. B Japan bombed Pearl Harbor. C France was invaded by Germany. D Japan invaded the Philippines. 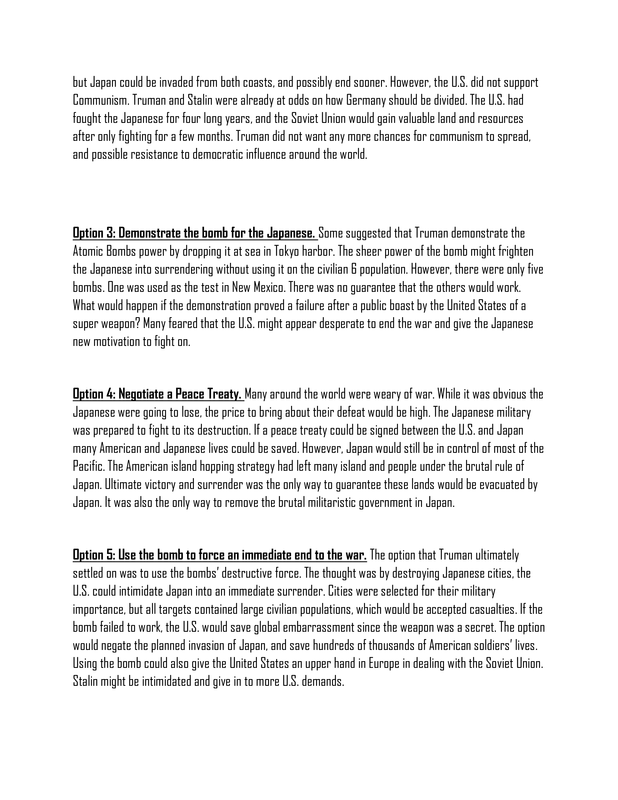 A U.S. plan to invade Japan. B German use of jet aircraft. 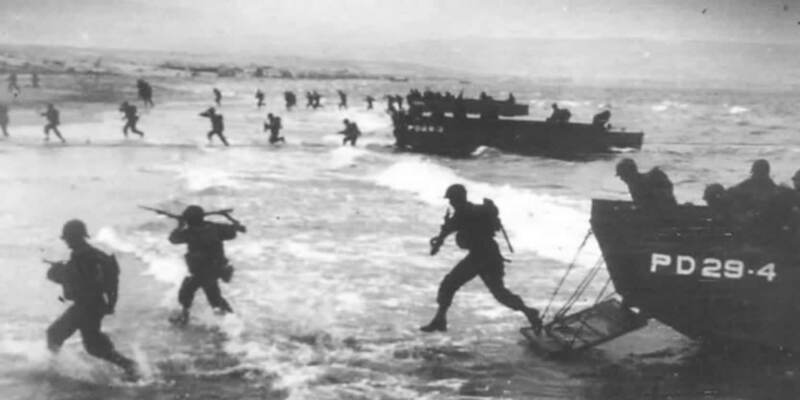 C Allied plan to invade Europe. D U.S. plans to make an atomic bomb. A he believed it would convince Hitler to surrender. B it was the last hope the U.S. had of winning the war. C Congress would not fund an invasion of the Japanese mainland. D it would prevent hundreds of thousands of deaths that an invasion of Japan would cause. What was the Allied strategy in the Pacific get around Japanese fortified islands in the Pacific? The United States had to take these two heavily fortified Japanese islands to get close enough to Japan to drop the atomic bomb or prepare for a land invasion of Japan. 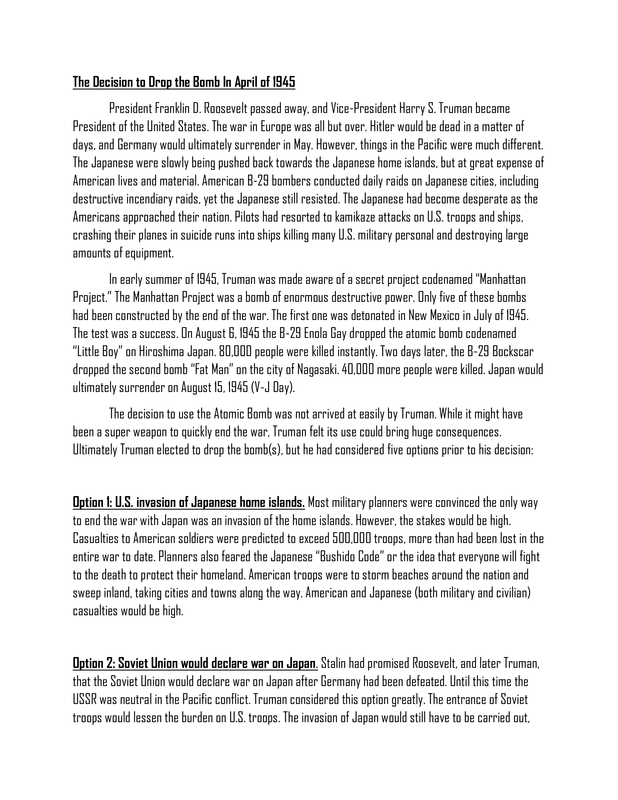 What was the NOT a reason President Truman ordered the military to drop an atomic bomb on Hiroshima in 1945? What occurred at Los Alamos, New Mexico during World War II? At this conference, Truman warned Japan to surrender of face "complete and utter destruction"
Which of these events occurred LAST? B Japan attacks Pearl Harbor. 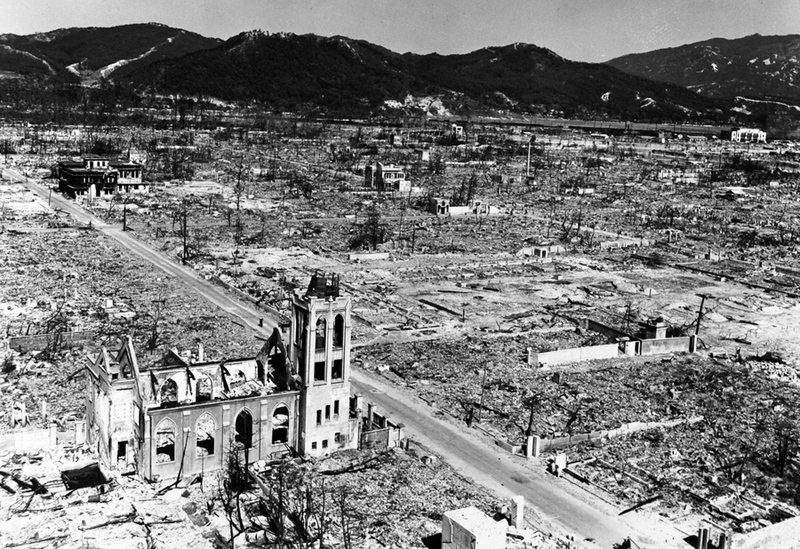 C United States drops the atomic bombs on Hiroshima and Nagasaki. A housing German prisoners of war from the European front. 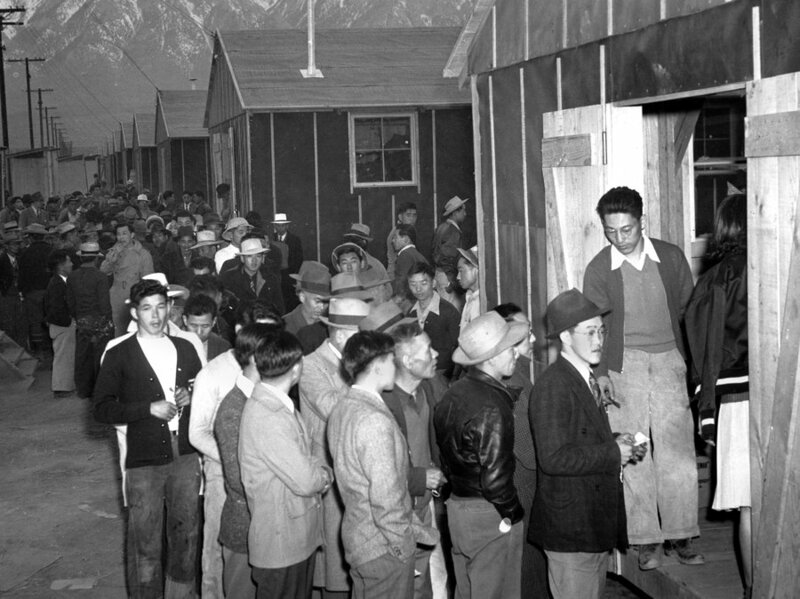 B relocating Japanese-Americans from California and Washington. 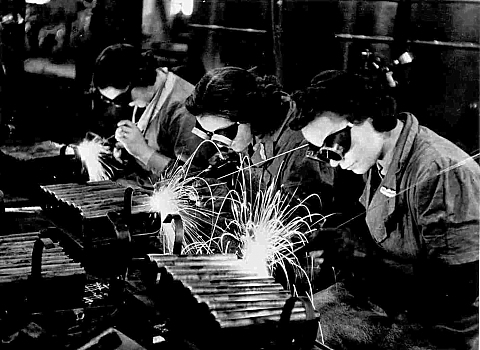 C constructing factories to make various weapons in World War II. D the building of an atomic bomb. 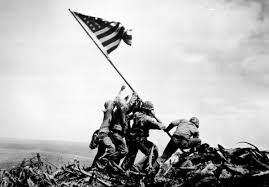 Overall is a land invastion of Japan by American troops a positive or negative option? Why? 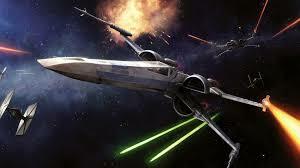 Overall is the Soviet Union declaring war on Japan a poistive or negative option. Why? Overall, is demonstrating the bomb for Japan a positive or negative option? Why? Overall, is negotiating a peace treaty with Japan a positive or negative option? Why? Overall, is using the bomb to force an immediate end to the war a positive or negative option? Why? What do you think the best option was and why?